March, 1918. C-company arrives to take its turn in the front-line trenches in northern France led by the war-weary Captain Stanhope (Sam Claflin). A German offensive is imminent, and the officers (Paul Bettany, Stephen Graham, Tom Sturridge) and their cook (Toby Jones) distract themselves in their dugout with talk of food and their past lives. Stanhope, meanwhile, soaks his fear in whisky, unable to deal with his dread of the inevitable. Click here to read our four-star theatrical review of ‘Journey's End’. The 'Journey's End' competition has now closed. Winners will be announced shortly. Competition opens at 5pm AEDT on Sunday 3rd March 2019 and closes at 11:59pm AEDT on Sunday 10th March 2019. Five winners will be chosen at random on Monday 11th March 2019. To successfully win, entrants must fulfil the above entry conditions before the time the competition closes. Current members/followers are eligible to enter the competition. Only one entry per person. Only one winner per household. To be a valid winner, the entrant must not have won a prize from SWITCH within the last 28 days. 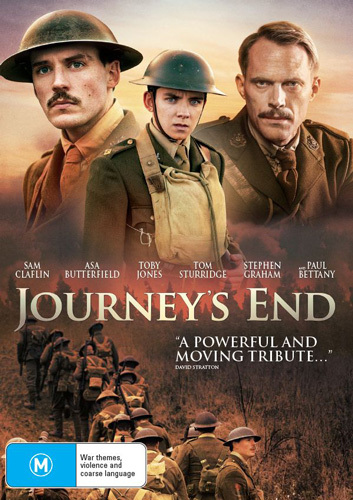 Each winner will receive one DVD copy of 'Journey's End'. By entering, you agree to receive occasional emails from SWITCH in the future. If you decide to unsubscribe from these updates, any further entries will not be applicable. Only Australian residents are eligible to enter. 'Journey's End' is available on Digital and DVD on Wednesday the 6th March 2019 from Icon.